The EHANG 184 Manned Passenger Drone is an autonomous aerial vehicle (AAV) that can carry a single person at up to 130km/h. The company has unveiled footage of manned test flights that is says is the latest in a series of tests to ensure that the EHANG 184 AAV will be safe and ready for public use in the near future. 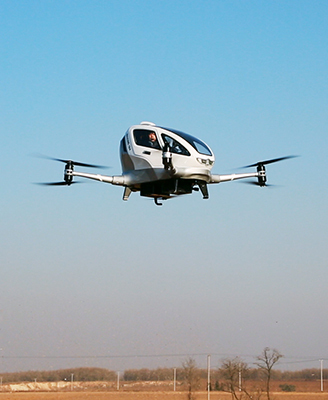 The aircraft has successfully been through over 1,000 flight tests carrying around 40 different passengers including Wang Dong, deputy mayor of Guangzhou, and EHANG founder and CEO, Huazhi Hu. “Performing manned test flights enables us to demonstrate the safety and stability of our vehicles,” Mr Hu said. The tests have reportedly included vertical climbs reaching up to 300m, a loaded test flight carrying approximately 230kg, a routed test flight covering 15 km, and a high-speed cruising test that reached 130 km/h. The company says the EHANG 184 AAV will still see further improvements. More emphasis will be placed on improving passenger experience and on adding an optional manual control, giving passengers with piloting experience the choice to operate the vehicle manually. In addition, the company has already developed and tested a 2-seat AAV with a payload of up to 280kg. In 2017, EHANG was granted the AS9100C certification, a quality management system widely adopted and standardized by international aerospace industry, and its AAV obtained the Special Flight Permit for civil aerial vehicles issued by CAAC (Civil Aviation Administration of China). Footage of the test flights can be seen below.